In order to choose one finalist from the pool of 30 books in our SPFBO batch this year, The BiblioSanctum had decided to read partials (approximately five chapters or 20-25% of each entry) to help narrow down our choice and determine a handful of five or six titles that we would want to put forward to the next phase. When I picked up Claire Frank’s Assassin’s Charge though, I didn’t need five chapters to know it was special. I was hooked after only the first few pages, gripped by the author’s smoothly polished and enticing writing style, but more importantly, I knew right away this was a book I wanted to spend more time with because I found myself irresistibly drawn by its enigmatic heroine. Rhisia Sen is the best at what she does. Known throughout the land as the Reaper’s Bride, she is one of the most notorious and highest paid assassins in the Empire. She’s efficient and disciplined, and the caution she takes while choosing her contracts is a way to guarantee that she will never miss a mark. That kind of dependability is what earned Rhis her success and reputation. However, all that is about to come crashing down around her. For her latest job, Rhis is only given the name of her target—Asher—as well as where she’ll find him, in a village located in a far-flung corner of the empire. It is a lucrative contract, which originated from the palace, and Rhis has reason to suspect that it came all the way from the Emperor himself. Still, believing this to be an assassination order like any other, Rhis sets off on a long journey across the ocean only to arrive at the designated rural village and discover that this assignment is like nothing she has ever gotten before. Asher turns out to a dark haired, silver-eyed foreigner who lives on a farm. And he is also just a little boy. Even the most hardened assassins have a line they will not cross, and for Rhis, she draws it at killing a child. This was NOT what she signed up for, and why would the Emperor order a hit on a harmless farmboy anyway? But before she can wrap her head around these bizarre circumstances, Rhis discovers to her horror that she has become a target of the Empire herself. Clearly, someone doesn’t want any loose ends, and now Rhis’ only shot at survival is to take Asher on the run and hopefully convince a few of her old allies to help the two of them stay alive. From this point onwards it’s a non-stop race around the Empire to avoid Imperial guards, Guild magicians, and even a merciless metal-armed bounty hunter. As enemy forces chase our protagonists across oceans and over mountain ranges, the pacing of this novel never lets up. And even though this cat-and-mouse pattern of events will continue to repeat itself over the course of the story, Claire Frank does a fine job keeping things interesting with plenty of action and mystery. Like, who is Asher and why is he so important? I confess, at first I thought I had the answers all figured out, but as it turned out, I underestimated the story’s potential. 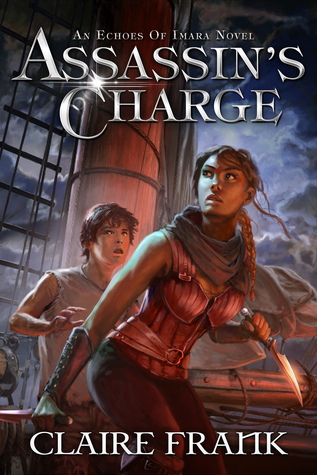 While it’s true that for the most part, Assassin’s Charge is an uncomplicated action and adventure oriented novel, I was still delighted to discover it had a few surprises tucked up its sleeves. But of course, my favorite thing about this book is what drew me in the first place: the characters. Rhis is a wonderful protagonist, complex and well-written. I found her personality and mannerisms very genuine, and in particular her obsession with routine and counting really resonated with me because I experience a similar compulsion, and I remember when the moment of understanding hit me during the beginning chapters when Rhis first showed this behavior. Though she comes off as harsh and aloof in the intro, Rhis has a good heart within her and that gradually becomes apparent as the story unfolds. I liked how that the transformation felt natural, as opposed to a swift and abrupt change in her personality. Her relationship with Asher is similarly written in a way that feels just right, with wariness eventually giving way to trust. And let’s face it: a lot of times, fictional partnerships where one of the characters is a child can potentially be really annoying, depending on said child’s personality and maturity levels in the book. Thankfully, I found Asher very likeable. He reads realistically like a young boy, but he also makes a great team with Rhis. As for criticisms, there’s the aforementioned issue with the repetitive nature of the story, and I think it’s more noticeable because the action and suspenseful scenes are spaced so closely together. There’s also a romance between Rhis and her old smuggling buddy Rickson (who’s like a roguish, charming piratey kind of character) which I thought was sweet, but could be better developed. Even though the two have known each other for a while, their relationship seemed to go from a spark to a wildfire in almost no time at all. Finally, I thought the ending was left rather open-ended. A couple major conflicts were resolved somewhat conveniently, and even then there were some important questions I felt weren’t answered in full. I’m not sure if Frank intends a follow-up novel about these characters, but I think this was meant to be a stand alone and yet I do get a sense of unfinished business. I also wouldn’t have minded more world-building and detail about all the exotic places we visit in the book; given the characters’ travel times, I imagine this must be a huge world. However, it wasn’t until after I finished reading this that I learned Assassin’s Charge is actually a separate tale that takes place in world that Frank had already established in a series called Echoes of Imara, so perhaps more background information and history can be found there. What’s certain for now is that I’ve just added those books to my reading list, because Claire Frank is definitely an author that I would read again. I really enjoyed Assassin’s Charge so thank you SPFBO for putting this book on my radar. Great review! I was really drawn to the cover of this when you first posted about the SPFBO. I am glad you enjoyed it, and it sounds like my type of read. I’m glad to hear that! It’s a very adventurous fantasy, well written and easy to get into. This sounds fantastic! I really appreciate this contest because I am super intimidated by the breadth of self-published work. I’ll look forward to how things progress but this one at least sounds like it is right up my alley. That’s also why I don’t usually read self pubbed books – not because I don’t want to, but because the sheer number of options out there intimidates me, and it takes a lot of time, luck, and patience to find the right read. I’m really enjoying SPFBO because so many gems are now being brought out onto the surface. This sounds great and clearly you really enjoyed it if you’re checking out the author’s other work. I’m looking forward to seeing what your final choice will be. Oh my, this sounds awesome! Sometimes the “greatest assassin ever” thing can get a bit old, but it sounds like Rhisia actually lives up to the name. And the fact that Asher’s a child is a great hook! A lot of the titles floating around in SPFBO realm seem to be on the shorter side; maybe this one would be stronger with some additions to flesh things out a bit. I love that cover so much, I’ll have to ask who the artist was. I don’t know who the artist is, but the author would know, maybe you can tweet her! Yeah, I did notice a lot of the books in our batch were shorter, which isn’t always a bad thing! We had everything from novellas to huge, epic fantasy tomes, but what we looked for was how well the story hooked us from the beginning. Assassin’s Charge really did that for me.